The Voyager’s distinctive reverse floor plan provides panoramic views of the lake from the main salon. Its sophisticated entertainment system has satellite TV, CD/DVD player and surround sound. A washer/dryer is conveniently, yet discreetly, located in the main cabin. Four convertible couches, queen beds in the 3 private staterooms and 2 bunks provide a wide variety of sleeping areas. 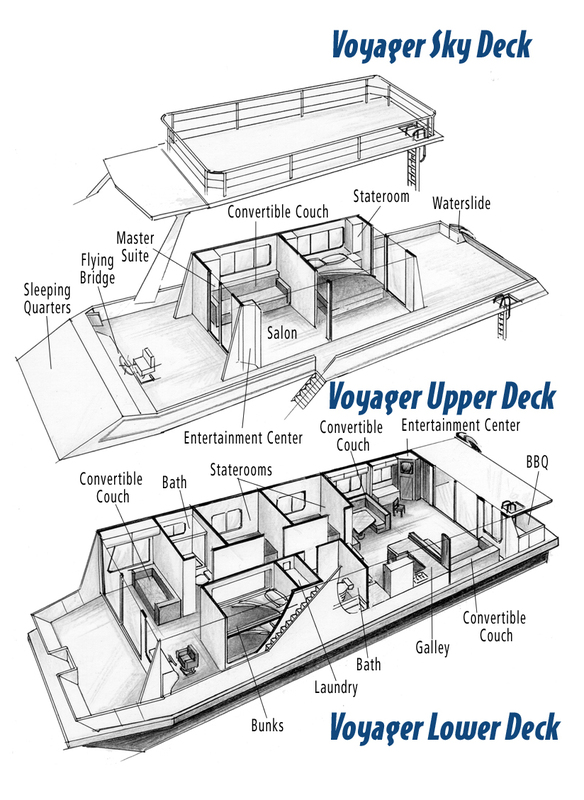 The air-conditioned master suite, with its own entertainment system, is on the upper deck for maximum privacy. The Voyager, available at Jones Valley Resort, will comfortably sleep 16 (22 max).